Oil on card, 45 x 59 cm. In many of his subjects from his time in Rome, Marstrand focussed on the spectacular and colourful folk life. An Osteria was a public house where people could eat and drink. 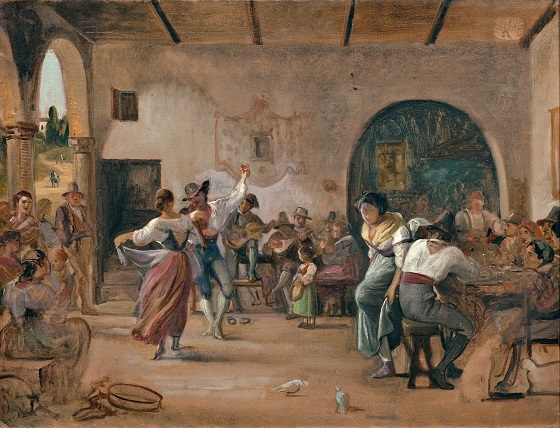 The folk scenes at the sites were a favoured subject and the Italian dance, the saltarello, greatly fascinated Marstrand. In many of Marstrand’s larger figure compositions from Rome, it is movement, often in the form of dance, which gives life to the painting. The populous composition is dynamic and the image is infused with the fresh lightness of a sketch. The foreground elements are painted with just a few, simple brushstrokes and the paint layer in the rest of the sketch is very thin, but still sufficient to clearly indicate how Marstrand wanted to reproduce colour, light and shadow.